Moulded plastic barrel and cap in high gloss colours with contrasting stainless steel or chrome trim.Cap On / Cap Off. Supplied with standard roller ball refill with navigator technology. Banking on our enriched industry experience, we are able to supply Parker Ball Pen Refills. In order to meet excellent quality standards, we are supplying Parker Ball Pen Refills. 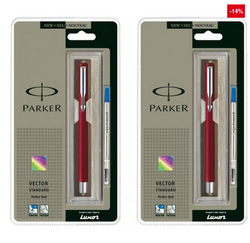 From our wide consignment, we are engaged in supplying Parker Ball Pen Refills. Our highly skilled workforce ensures that our product Pen Refill is designed in the most effective way at vendor’s end. Our reputed entity is engaged in supplying Parker Ball Pen Refills.